Using high-efficiency plumbing fixtures and appliances will not only help you conserve water but it will help you save on your next utility bill. You can save up to 30% of indoor water use by making the switch. This switch will not only affect your water bill but will help you save on energy as well. Turn off the tap when brushing your teeth or washing dishes. Take a 5-minute shower or a shorter shower to save water. 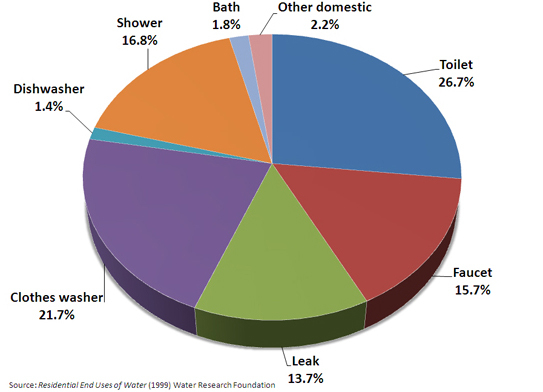 Toilet leaks can waste up to 200 gallons of water per day. These leaks are usually an easy fix and fairly noticeable. Approximately 5 to 10 percent of US homes have easy-to-fix leaks that drip away 90 gallons a day or more. If using dishwasher or clothes washer make sure they are fully loaded to save water. WaterSense also provides more tips and tricks to help you conserve water indoors.